Jacques Brel sang that flowers are perishable and that is why he brought candies to his beloved partner. Replace the candies with chocolate and you will get the perfect sweet treat for your darling. Chocolate-based recipes are usually easy to make and that’s exactly what you’re looking for when you need to produce in large amounts. And as no one can resist a creamy fondant, a moist brownie, an aerial mousse or a crunchy cookie, you can – without too much risk – think big in terms of production. Especially if the star (of this Valentine’s) will be chocolate. As always, for your convenience, we offer quality ingredients that are easy to use. Follow the guide for an overview of our products: chocolate in all its forms! Let’s start with the most important: the very base of your pastry. Whatever shape or consistency you decide to give it, for a strong chocolate taste, it is better to choose good quality chocolate. 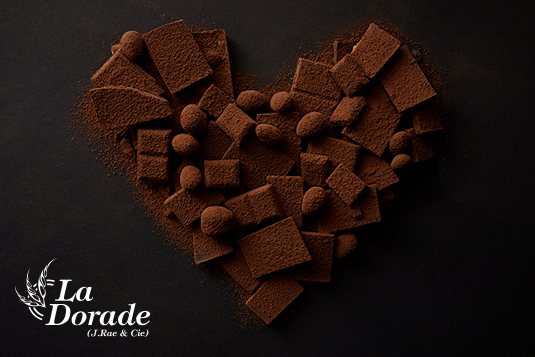 Our 5 kilos blocks of dark chocolate are perfect for that. And for those who want their work to be even easier, we also offer crushed chocolate in packs of 5 and 10 kilos. Our crushed chocolate is available in both black and white. It can be melted to be mixed with the cake dough or kept as is or slightly chopped to add texture to your pastries. What if you nestled a surprise in the heart of your pastries for (chocolate) lovers? A chocolate cake is good. But a chocolate cake with chocolate chips is better, right? Our chocolate chips are available in dark chocolate and packs of 5 and 10 kilos. Do you see things a little bigger? Opt for our chocolate drops (44%), available in packs of 5 and 10 kilos. Do you want to innovate? Why not find a new use for baking sticks traditionally used for ‘pain au chocolat’? Think about it, you’ll thank us later. They are available in boxes of 500 sticks. While the packaging is not what’s most important, it cannot be set aside either. Pay attention to the decoration of your pastries and they will be even more appetising. Our extra dark disks (64%), available in packs of 5 kilos, creamier and richer, are perfect for making ganaches or coating chocolates and truffles. You have decided to stick with something simpler but just as effective? Our chocolate vermicelli, in packs of 1 and 5 kilos, and our chocolate powder (70%), in packs of 2 and 25 kilos, are your allies for a simple and delicious decoration. We are already dreaming of a delicious chocolate cupcake covered with creamy buttercream, chocolate, of course, and dusted with chocolate vermicelli; what else? Why complicate things when they can be simple? 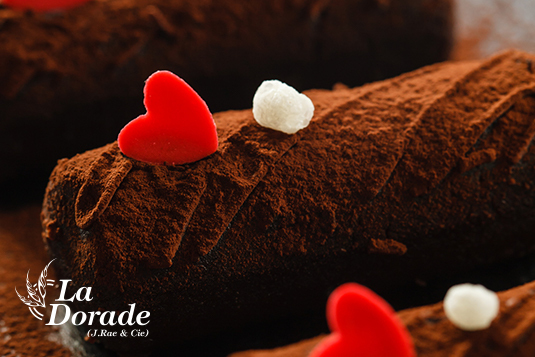 This Valentine’s Day, opt for chocolate, a safe bet, and spread the love!